Yes, reading strategies – and explicit teaching of them – make a considerable difference, as my previous four blog posts here, here, here, and here make clear. 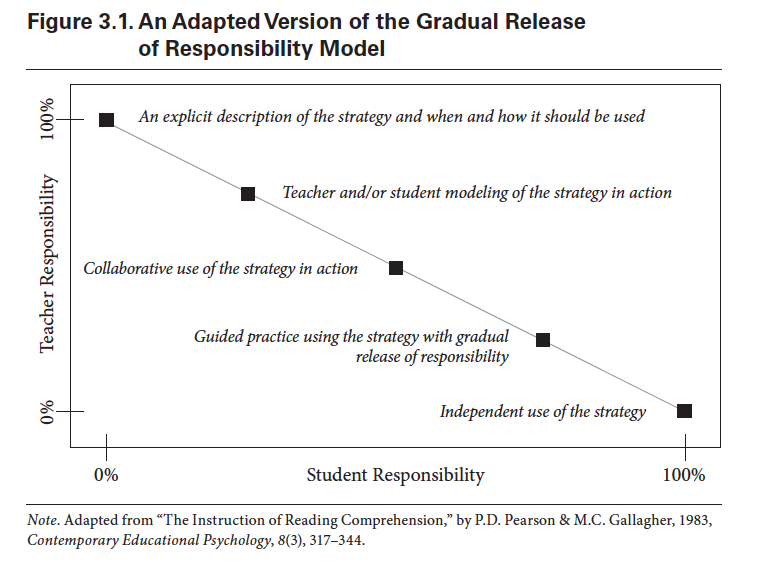 And there is much to like about the idea of the gradual release of (teacher) responsibility in the teaching of those strategies for reading – or anything else where we want skillfulness. The approach is interactive, empowering for kids, easy for most teachers to grasp and implement, and grounded in research. Great: a proven guide to teaching each strategy! What’s not to like? The real last step. Well, a key step towards the goal of the strategies is missing. In light of our discussion so far, do you see the critical mistake that users of this approach might easily make by relying only on these graphics and the explanatory text? Look at the so-called last step: independent practice. That is surely not the last step in developing self-regulated meaning-making. The last step is arguably fluent, flexible, and self-regulated selection and use from a repertoire of strategies – namely, successful transfer of learning for comprehension. Effective teachers of reading comprehension help their students develop into strategic, active readers, in part, by teaching them why, how, and when to apply certain strategies shown to be used by effective readers (e.g., Duke & Pearson, 2002). Although many teachers teach comprehension strategies one at a time, spending several weeks focused on each strategy … this may not be the best way to organize strategy instruction (Reutzel, Smith, & Fawson, 2005)…. 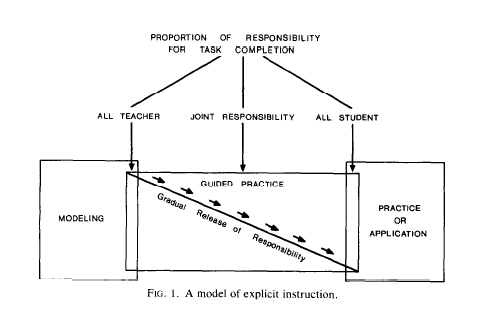 Studies and reviews of various integrated approaches to strategy instruction, such as reciprocal teaching (e.g., Palincsar & Brown, 1984), have suggested that teaching students comprehension routines that include developing facility with a repertoire of strategies from which to draw during independent reading tasks can lead to increased understanding (e.g., Brown, 2008; Guthrie, Wigfield, Barbosa, et al., 2004; Spörer, Brunstein, & Kieschke, 2009). Alas, no practical guidance is offered here on how to accomplish such an integrated approach. Rather than teaching students how to become self regulated learners, teachers seem to expect behaviors would naturally develop through prompted questions. There is of course no evidence that such prompting leads to anything like active self-regulated use of comprehension strategies. Yet, despite these warnings in the literature, I have seen this problem first-hand time after time in classrooms: teachers follow this graphic in organizing the teaching of all the strategies – and, worse, rarely assessing the extent to which students, unprompted, use the strategies when reading new text. We turn now to the instructional mode, how to teach the activities. One main concern was to try to avoid a common problem with traditional training studies, the outcomes of which have been somewhat discouraging. Although improvement on a particular skill in isolation has been reported, this improvement is often slight and fleeting, and there is very little evidence of transfer. Maintenance over time, generalization across settings, and transfer within conceptual domains are rarely found. [D]eclarative and procedural knowledge alone are not sufficient to ensure that children read strategically. They only emphasize the knowledge and skills required for performance and do not address the conditions under which one might wish to select or execute actions… We want to introduce a new term, conditional knowledge, to capture this dimension of learning to be strategic. Conditional knowledge includes knowing when and why to apply various actions. For example, skimming is a procedure that is only appropriate for some tasks and situations. The procedure needs to be applied selectively to particular goals in order to be a strategy. Toward successful transfer of learning. How then is such flexible self-regulation in building meaning of text more likely to happen? How can teachers more likely facilitate transfer of learning vis a vis the comprehension and metacognitive strategies? Students develop flexible understanding of when, where, why, and how to use their knowledge to solve new problems if they learn how to extract underlying themes and principles from their learning exercises. Understanding how and when to put knowledge to use—known as conditions of applicability—is an important characteristic of expertise. Learning in multiple contexts most likely affects this aspect of transfer. These are all helpful points, for sure, but probably not concrete enough or supported by relevant English/ELA examples enough for most teachers to apply directly. So, in my final posts I will offer a tentative set of practical implications of all this research for teachers in grades 6 – 12 who are trying to improve comprehension and achieve self-regulated transfer of learning in students. I will also share some excerpts from books written for teachers of English that provide the most helpful tools and tactics reflective of this research. And I’ll return to a classic text that I have recommended before: its wisdom holds up 75 years later. This article gave me a headache! Education is just too complicated now and I’m not sure how it got to be this way. While I’m not an certified teacher, I am an expert at teaching. No, I’m not special, I simply have a firm grasp of accelerated learning techniques and methodologies that make learning so much easier for students and makes teaching so much easier for teachers. I have been using these five principles in my financial education programs since 2005 when the world of accelerated learning was put in front of me and I discovered my passion and the way to differentiate my personal finance camps called Camp Millionaire and Moving Out for Teens from the rest of the boring, worksheet-ladened, lecture-driven programs. In all of the years I have been teaching this way, I always have students who come up to me during the programs and ask this simple but unanswerable question: “Elisabeth, why don’t more teachers teach the way you do?” I wish I had a good answer for them because they go back to school more bored than ever after having experienced our programs which are interactive, experiential and profoundly fun and engaging. If my memory serves me well, and it usually does, all it took for me to want to read a book was that it fit into one of the following criteria: it was interesting, intriguing, entertaining, taught me lessons I was looking for, solved a problem I was having or my favorite, showed me how to think about something in a new way. If I was interested in the book, I comprehended the information. It was that simple. I often ask students what classes they are taking in school and often I get the ‘reading class’ answer. I ask them what they are reading and they rarely tell me with excitement. It’s more that they roll their eyes and say they ‘have’ to read it for the class. I had one gal tell me that she realized that all she had to do to get an A in the class was make sure the teacher saw her underlining or highlighting sections in the books she was reading! Of all things! Regardless of whether kids come into my camps from traditional schools where they are doing well or struggling, or anywhere in between, they leave my programs having learned (which means they remember the information so they can use it later when they need it) more in a short amount of hours or day than they ever learn in their regular classrooms. I wrote a blog article myself yesterday on how I would personally go about fixing our sick education system. I’m sure you and most of your readers could have written it as well. Perhaps you will enjoy it. It’s my perspective from 13 years of teaching kids and teens and being in all sorts of schools with all sorts of teachers. My favorite and best experience was teaching The Money Game to a group of 4th and 5th graders whose teacher was also an expert in accelerated learning. What a fabulous experience that was for all of us! I find that Van de Pol, Volman’s and Bieushuizen’s distinction between responsive and contingent teaching to be particularly helpful. The authors clearly distinguish rote teaching and contingent support as crucial in helping students internalize the strategies we teach. Not only do we want to see students adapt metacognitive moves when they read, we as teachers must constantly adapt how we teach those moves. If we merely follow a script, we do a tremendous disservice to them – and to Pearson and Gallagher. Van de Pol, J., Volman, M., & Beishuizen, J. (2010). 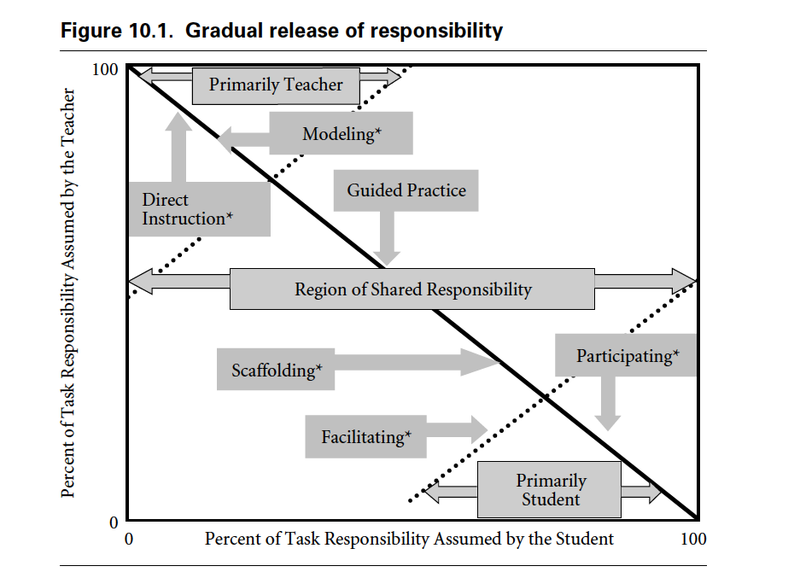 Scaffolding in teacher-student interaction: A Decade of Research. Educational Psychological Review, retrieved from DOI 10.1007/s10648-010-9127-6. I also find Duffy’s work helpful in clarifying the importance of modeling in an effort to move students toward independent application of reading strategies. Duffy asserts that effective scaffolding moves students from application of strategies to internalization of process. In other words, the focus is NOT on skill acquisition. In this way, strategies become skills. Mental modeling is crucial if this is to occur. Duffy, G.G. (2009). Explaining reading: A resource for teaching concepts, skills, and strategies (2nd ed.). New York, NY: The Guilford Press. Again, thank you for your continued posts on reading. I have enjoyed them. Thanks, Andrew. I have seen Duffy’s work referenced a lot but couldn’t find much online, so this is a great tip. I’ll order it today. PS: I fixed the typo. Duffy, G.G., Roehler, L.R., & Hermann, B.A. (1988). Modeling mental processes helps poor readers become strategic readers. The Reading Teacher, 41, 762 – 767. Retrieved from http://www.jstor.org/stable/20199919 . Hope the link still works. I have read all these posts so far and what you are describing is what is wrong with the content and teaching of math in schools. Oh dear ! Just read it. Agree entirely. Doesn’t look as though the CCSSM is going to make much difference. In the UK very very few kids study maths beyond year 10. It’s optional. I loved the quote from A Mathematician’s Lament. Thanks! How many students Learn Some Strategies and, in fact, it’s just One More Rote Procedure To Please The Teacher ? Please the teacher is the #1 game in school, not soccer…. Ah, but is it “teacher propensity” or the unfortunate belief that teachers are not smart enough? I’m not sure it is teachers who create the recipes but those who aim to characterize teachers as incapable of implementing the kind of thoughtful instruction that is essential. Rich professional development that includes embedded, classroom-based coaching is key along with the belief that reading, as you note, is always about making meaning. I’m not assessing the cause; I merely see the behavior endlessly: worrying about filling in boxes, worrying about following scripts, worrying about quantities instead of qualities – means instead of ends. In many cases, for sure, it’s a function of poor PD and oppressive admins. But in many cases it is not – indeed, I see that behavior in private schools with barely a supervisor in sight. (I have worked with a few teachers who don’t know what to do when the Calkins lessons do not turn out the way the sample conversations go, for instance). It’s the same thing that happened with Madeleine Hunter’s work and, way back, Bloom and Dewey’s How We Think. People glom onto simple cheat sheets and simplifications far too often in this field – for whatever reason. All I am saying is that a concerted effort to end this reductionism and reification of tools is in everyone’s interest. Thank you for this set of posts. As you note, the three types of knowledge are often lacking in comprehension instruction. Declarative knowledge is almost always present but results in “teaching as telling.” However, it is necessary to “notice and name” as Peter Johnston reminds us. I find procedural and, as you note, conditional knowledge missing too frequently. But even when we include, the missing ingredient may be in coached use within the performance of reading. The notion of refinement was clear in that first P&G paper. Until we understand we cannot teach reading without a text while reading, we will continue to struggle. We would never attempt to teach tennis without a racquet and ball. Sadly, I’m afraid there are too many who will promote fluency and accuracy as ends unto themselves and proxies for real reading because they are easy to measure and use to design quick-fix programs to sell. We are reaping the “rewards” from an era where fluency and accuracy were privileged, and we have the largest group of upper elementary and middle school students ever who think fast and accurate are the qualities of good reading.” Teaching comprehension demands that shared consciousness with the learner Vygotsky wrote about. It’s funny that you say that because I didn’t include the lengthy hand-wringing in the 2011 chapter about bad implementation that is too script – and accountability- driven in terms of teaching the comprehension strategies. Yet, this is the Achilles heel of all processes, tools, and approaches – including my own (UbD): it becomes a thoughtless fixation on means instead of the end. That’s why I think the graphic adds insult to injury: it actually encourages the kind of thinking the authors decry! The only way to develop conditional knowledge (strategic thinking in terms of goals) is to make clear over and over again that understanding the text is the point and the means don’t much matter specifically. Ironically, most of the research of the last 20 years says repeatedly that it doesn’t matter which strategies are used. Yet, that message is instantly lost when they get listed and described. Until and unless we tackle the teacher propensity to reduce ideas to recipes and conditional logic to rigid rules we will not professionalize the field. PS: I am fascinated by the endless reference to Vygotsky in the reading literature. I know of no other area of education where it is so commonly referenced as a seminal reference point. I frankly think it holds us back in some ways. The issue is more practical and concrete: how do you develop fluency of ‘moves’ followed by judgment in how to use those moves? Any soccer coach can answer the question – without referencing ANY experts. In my final posts on practical next steps, this will basically be the point: when you are clear about the goal, you don’t fixate on means. Good posts, Grant, and I have enjoyed reading the thoughtful responses. I agree that understanding the text should be the goal, not the use of strategies per se. That is a critical point you made. I think effective instruction does involve the teacher modelling how she attempts to understand a text, and naming strategies she uses; however, when we then assess students’ efforts at understanding what they read, our focus should be focused on evidence of comprehension, not how many different strategies they used to get there. I did find it helpful, though, if I asked the students to record evidence of their thinking as they read, either through sticky notes or margin comments. That way, I could assess how the struggling students were attempting to understand what they were reading, and could offer on the spot feedback and prompts. It provided a window into the process of comprehending, instead of just looking at the end results in terms of answers to questions about the content of the text. It also facilitated small group and class discussions around strategies students had independently used that helped them understand forms of texts in different contexts. Re: ” … Focus lost on the goal for which strategies are the means” Absolutely yes. One commercial reading resource used in Ontario gives teachers a rubric to use to assess students’ use of strategies and level 4 refers to students using a wide range of strategies versus a narrow range. I am guessing the creators of the resource meant for teachers to link strategy use to effective comprehension, but as you said, if that is not done, a student could have used a wide range of strategies, yet shown only some comprehension, due to ineffective use of several strategies. And of course, the opposite could be true also, with deep comprehension being shown by a student who overtly recorded use of only one or two strategies. Unfortunately, analyzing student responses for qualitative content takes a lot more time that looking for quantitative evidence. Looking forward to the next part of your posts. The first cut at recommendations is now up.